By late morning, Wednesday May 17, There was blue sky over Horseshoe Bay, and we thought we could see fresh snow on the local mountains. We took the rest of the day off and headed up the hill to ski. As we drove into Cypress Bowl we noted that there was plowed fresh snow along the side of the road. 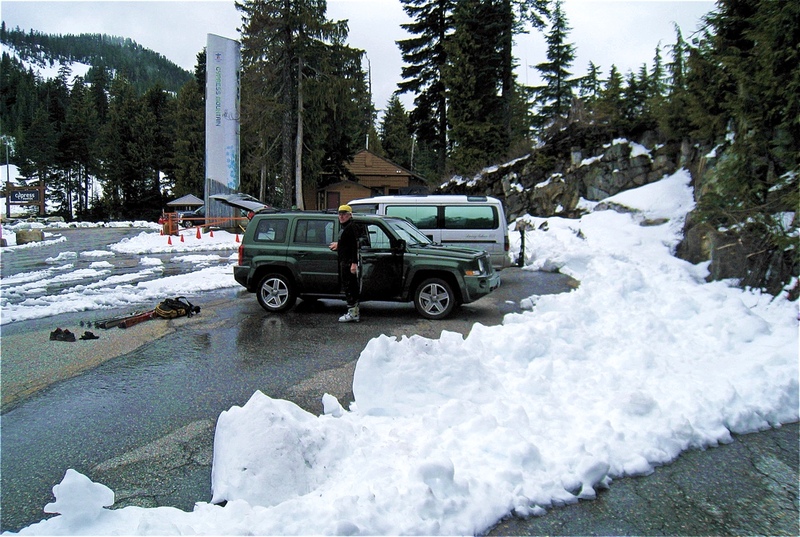 We parked at the top of the public paved road (3010 ft.) and marvelled at the recent dump of new snow. As we skinned up Mount Strachan the fresh snow became deeper. There were a few day-old tracks so the dump of snow arrived a couple of days ago. We quickly climbed into a dense cloud. By the time we reached the summit ridge, the clouds had thinned and occasionally we glimpsed the disk of the sun. With my ski pole, I measured the depth of the fresh snow: 16-inches! This has been an unusual spring. The local temperatures have remained cold and we’ve had lots of precipitation. The size of the snowpack up on our hills is awesome. The drone pictures and commentary in this Clubtread forum thread provide an interesting perspective of the current snow the conditions high up on Mt. Strachan: North Shore Cornices. Today, from the ferry on the Salish Sea we could see that the tops of the mountains were in the clouds. Up there we experienced drizzle or heavy mist. There was hardly any snow until we drove into Cypress Bowl. 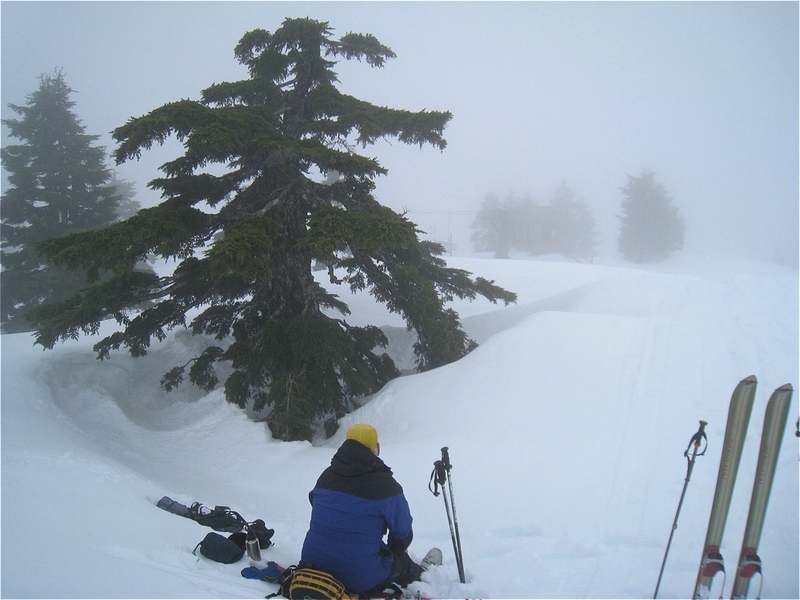 Once on skis and heading up Hollyburn Mountain we were pleasantly surprised by the depth and quality of the early snowpack. It was a lovely day on the hill.